Posh substitute Shaquile Coulthirst shoots wide late in the game against Oldham. Photo: David Lowndes. Peterborough United manager Graham Westley believes his side are suffering a massive FA Cup hangover. 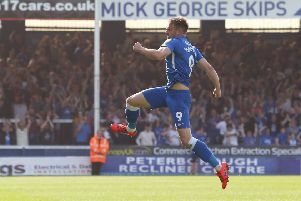 Since losing to Premier League West Brom on penalties in a fourth round FA Cup replay earlier this month, Posh have lost three League One matches in a row, the latest at home to relegation-threatened Oldham last night (February 23). Posh man-of-the-match Marcus Maddison sends in a cross against Oldham. Photo: Joe Dent/theposh.com. Posh deservedly went down 2-1 to an early goal, following a horrible error by recalled left-back Kgosi Ntlhe, and a second-half penalty following a mistake, and then a foul, by goalkeeper Ben Alnwick. Souleymane Coulibaly had equalised for Posh towards the end of the first half after man-of-the-match Marcus Maddison had struck the crossbar. Westley accepted that in-form Oldham were worthy winners. “I have to believe that there is some sort of hangover from the cup tie affecting my players,” Westley stated. “We have a good bunch of lads, some really good people, and they haven’t downed tools because they can’t be bothered any more. “But they are so far short of what it takes to win a football match right now and it’s been the same since the game with West Brom. They lacked speed, urgency, the confidence to carry out a game-plan and to put into practice what we had coached into them. Former Posh skipper Ben Alnwick throws the ball out against Oldham. Photo: Joe Dent/theposh.com. “What I have is a set of young players who worked themselves into a frenzy in an attempt to reach the last 16 of the FA Cup and it has drained them physically and mentally even more than I had originally realised. “I’ve tried to snap them out of this malaise by speaking to them one-on-one and by making selection changes. We’ve shouted at them to try and bring them out of the slump and to kick some sense into them. We worked really hard between the loss on Saturday and this game. “But we are stuck in a rut. We have lost some motivation and we will have to work out why and then work through it. Some of our lads look lost in the dressing room, They don’t know what’s going wrong. “You can say I am paid to find the answers and I believe I know what is wrong. Our collective ambition tonight didn’t match Oldham’s. They are a side fighting together for the right to stay in this division and their desire was greater than ours. My players need to do some work mentally to make sure we can get ourselves ready to win the next game. “We were not good enough for long periods tonight, particularly in the second-half when we couldn’t match Oldham’s will to win the match. “We lost a sloppy early goal, but we worked our way back into the match to get level by half-time. “But I could only see one team scoring in the second-half. The penalty was actually a difficult decision for the referee to make, but at that point in the game Oldham deserved to get in front. They had shown the greater athleticism and the greater ability. They were far more positive than us. Posh were without suspended central defender Michael Bostwick and injured midfielder Chris Forrester, who had a scan on his knee injury yesterday. Westley made three changes to his back four which included a first start since August 18 for the transfer-listed Ntlhe. “Left-back has become a problem position for us,” Westley added. “Kgosi played very well in a reserve team game last week and the time was right to bring him back. Posh remain 12th in the League One table, eight points outside the play-off zone and 11 points clear of the relegation zone. They host Swindon at the ABAX Stadium on Saturday (February 27). Goalkeeper Alnwick gave up the Posh captaincy ahead of tonight’s match as he and Westley believe an on-field skipper will be more beneficial to the team. Gaby Zakuani wore the captain’s armband last night.